18 • April 2018 • S I G N & D I G I T A L G R A P H I C S ELECTRIC SIGNAGE However, when placing LEDs in a cabinet sign, it seems there is a sweet spot when trying to generate the optimal amount of brightness. 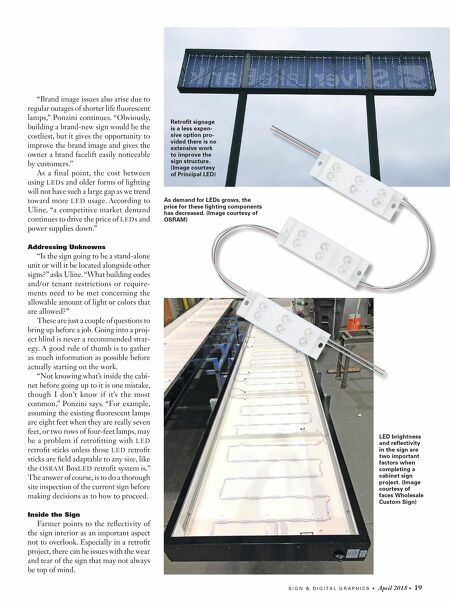 "I don't know if people would find it desirable, or even necessary, to retrofit a sign cabinet with LED sticks at closer than one foot on center since the existing sockets will likely be on one-foot cen- ters," says Ron Farmer, CEO at US LED, Ltd. "If the cabinet has 20 sockets and they want the cabinet to be 20 percent brighter, the sign installer will need to use a mounting foot for attachment and put them on 10-inch centers, adding four more sticks. It is more work and added cost. Since the LED sticks will likely be brighter than the fluorescents being replaced, it seems unlikely that it would be worth the effort, unless there is some reason the added illuminance is advanta- geous. One of our products gives even lighting when placed on 24-inch centers. So, depending on the customer's needs and preferences, using less product can be an option." Sign makers should act as consultants to their customers, deciding when a retrofit or new build project is most appropriate. (Image courtesy of OSRAM) LEDs are used to improve the brightness of pole signs, channel letters and more. (Images courtesy of US LED) Price Differentials One of the biggest factors in provid- ing a cabinet sign is the size of the cus- tomer's budget. According to Farmer, "Is it more cost effective to retrofit an existing sign than make a new one? Yes, absolutely. But if the sign and framework are severely rusted, it's a different story. Many times, we took down an old sign and replaced it with a new one mainly because it was just too much trouble to repaint the interior and exterior and redo the wir- ing and sockets (before LEDs). It was a safety issue, as well, in some cases." Sign makers should make suggestions based on their expertise on whether a ret- rofit or new install would work best. But, ultimately, it's the customer's choice to decide which way he or she would like to proceed. 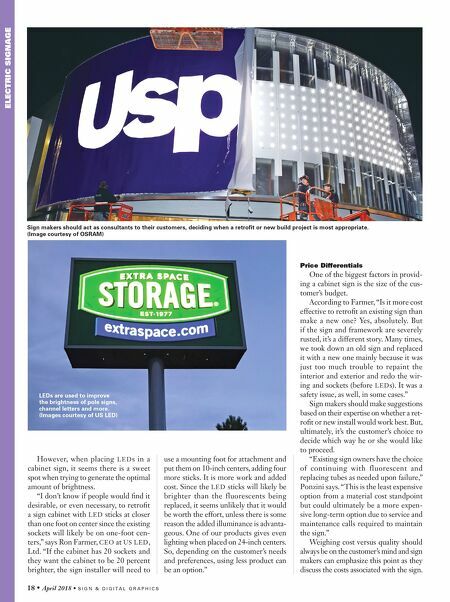 "Existing sign owners have the choice of continuing with fluorescent and replacing tubes as needed upon failure," Ponzini says. "This is the least expensive option from a material cost standpoint but could ultimately be a more expen- sive long-term option due to service and maintenance calls required to maintain the sign." Weighing cost versus quality should always be on the customer's mind and sign makers can emphasize this point as they discuss the costs associated with the sign.